So you want to know if a Kindle Touch ordered from Amazon.com will work correctly in the UK. * The Menu item called "Shop in Kindle Store" does not work and says that this is not supported for the UK store at this time. You CAN however just use the Kindle's web browser to go to the Amazon website with 3G/Wi-Fi at any time and order books from there as well as transfer and email documents in all the usual ways. 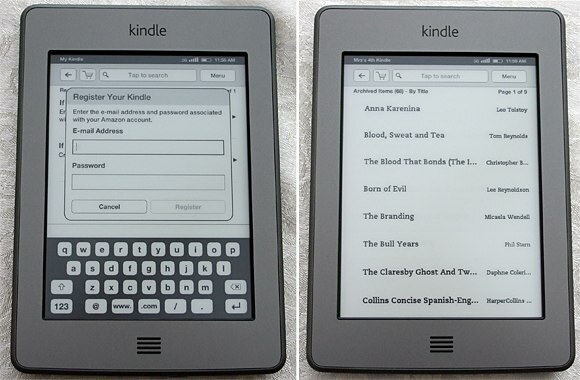 Kindle before registering and after registering to my UK account. Normally you can't order a Kindle Touch from the US unless you have a US shipping address, but there is a painless way to get around this. Q. Can I order a Kindle Touch even if I dont live in the US? Q. How much will it cost to have a Kindle Touch shipped to the UK? Q. 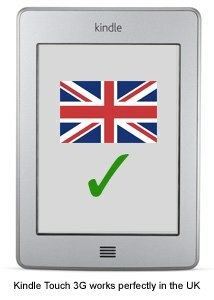 Can a US Kindle Touch be registered to a Amazon.co.uk account? Q. Does the Kindle Touch / Kindle Touch 3G work correctly in the UK? A. Yes, everything works perfectly. Q. Is it worth getting a Kindle Touch? This will depend on the shipping options you choose from Amazon and Bundlebox as well as Amazon's estimated dispatch time. Assuming no delays or stock shortage, if you chose the fastest options you should have it within 5 days. If you are thinking of ordering for Christmas, you should order as soon as possible just to be safe. Lou, Can you later the margin size like you could on the K3 KB? Because I don't really fancy having the huge margins that Amazon give us. (17 Nov 2011 01:22 PM)bookworm65 Wrote: Lou, Can you later the margin size like you could on the K3 KB? Because I don't really fancy having the huge margins that Amazon give us. I've had a look, and if there is a way to do it, it's not the same as the old Kindles. There is no sign of the configuration file, so it may have been moved to a hidden portion of the OS. Love the new avatar Lou, there is no beating you is there! Glad it all seems to work, an experiment well resolved. Hi Lou, new here, just wondering can it be registered to Amazon US and books downloaded from there? I'm in Ireland by the way. Yup, Amazon US is no problem at all. Quote: Hi, thanks for this it was exactly what I was looking for as I am on vacation in the US at the moment. Is the version you tested one of the cheaper ones with 'special offers' ? The version tested is the one without the special offers, but the on with special offers would also work just fine and you can get the offers removed at a later date. So which do you prefer, Lou, the Touch or the Keyboard? (17 Nov 2011 03:09 PM)bobb42 Wrote: Hi Lou, new here, just wondering can it be registered to Amazon US and books downloaded from there? I'm in Ireland by the way.